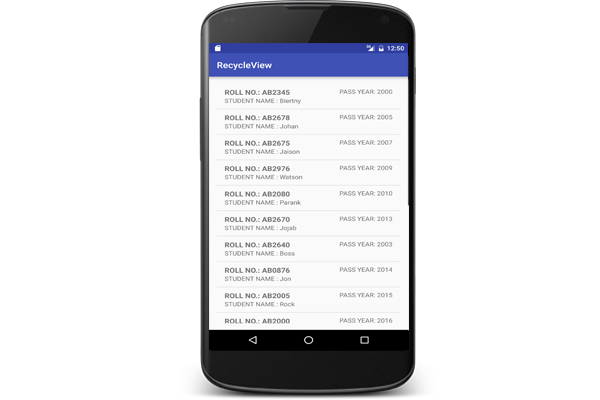 The RecyclerView latest version of listview and improved performance and benefits. RecyclerView provide flexible view with large data set. Recycle view support features made available on newer version of the platform. For example Android lower than 5.0(API level 21) .that relies on framework classes cannot display material design elements. First open build.gradle and add recyclerView dependency. Create Item Class and add the getter/setter method. Create new list_row.xml layout and used in recyclerview row and display Student Detail in single row. create new DividerItemDecoration.java Decorate class via this class set RecyclerView Divider/ separator.